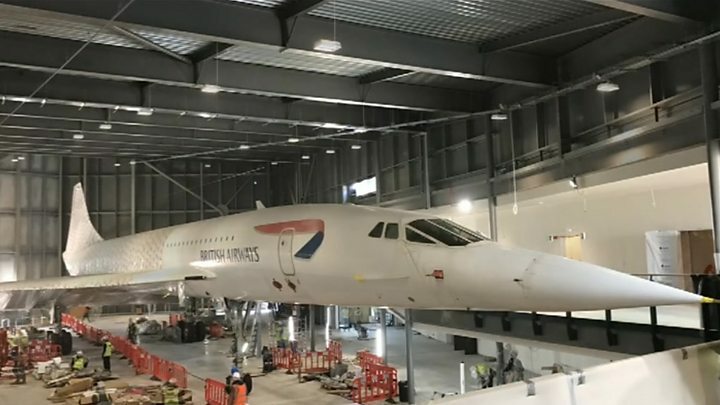 The last Concorde to take to the skies has been unwrapped ahead of the grand opening of a new museum. Hundreds of metres of film protecting it from building work around it were carefully peeled off Concorde 216. The jet will be the supersonic centrepiece of the £19m Aerospace Bristol centre, which will document the city's aviation heritage. The museum's executive director Lloyd Burnell said he hoped the centre in Filton would open in August. Concorde 216 was towed into its new home in February and was wrapped up as fire protection paint was sprayed on the walls of its hangar. The last Concorde built and the last to fly will next be fixed up, cleaned and polished by Airbus, before being handed over to the Bristol Aero Collection Trust, the charity behind the new museum. "It's fantastic to see Concorde unwrapped and looking stunning in her brand new home," said Mr Burnell. "As the centrepiece of Aerospace Bristol's exhibition, Concorde will inspire the next generation to pursue careers in engineering and develop the big ideas of tomorrow. "We can't wait to welcome our first visitors on board this summer."